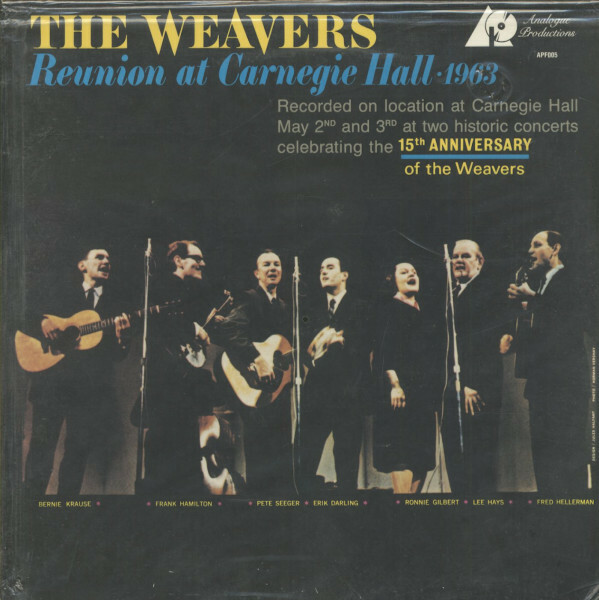 (1986/Vanguard/Analogue Productions) 14 tracks - Recorded on location at 'Carnegie Hall', May 2nd and May 3rd at two historic concerts celebrating the 15th anniversary of the Weavers. Limited edition, done from 'Analogue Productions'. Carnegie Hall, New York's premier concert venue, was filled to capacity on Christmas Eve, 1955. 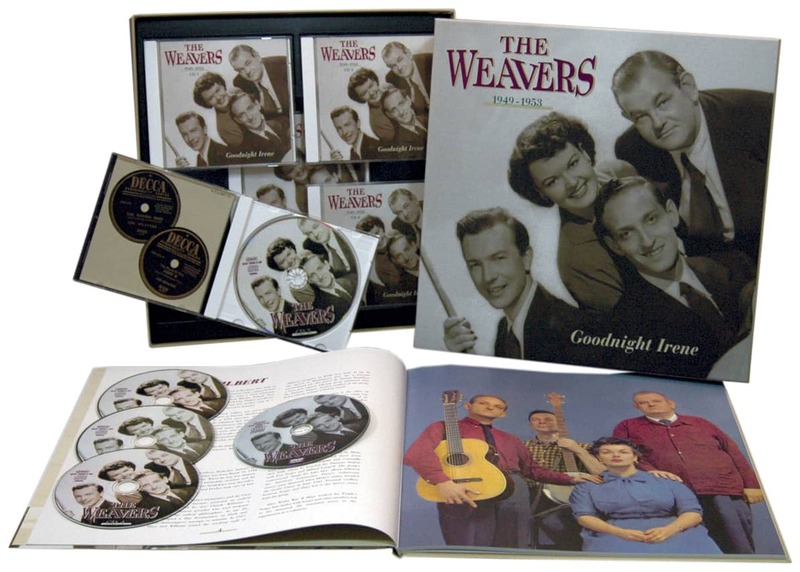 The occasion was the Weavers' first holiday concert in three years. Frankly, no one really expected to see them again. Starting in 1950, the folk group started a Gotham holiday tradition with its popular December concerts at Town Hall. 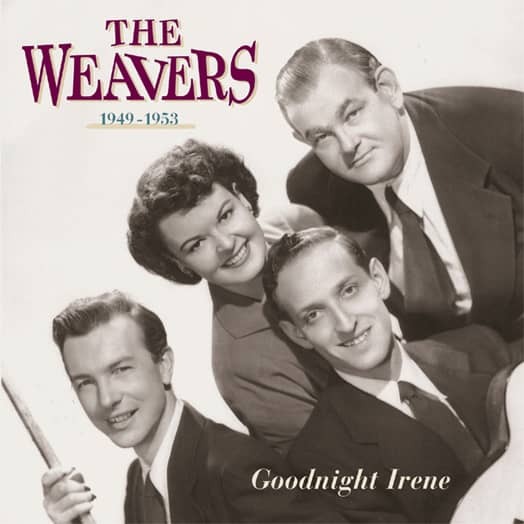 But the Weavers quietly disbanded after its 1952 concert, partially because of internal pressures but primarily as victims of an unrelenting blacklist. "We took a sabbatical," bass singer Lee Hays later explained. "Then it turned into a Mondical and a Tuesdical." But those years were creatively fallow, and some band members were virtually destitute. By 1955 banjo player and tenor lead Pete Seeger had built a small, loyal following through college appearances and steady-selling Folkways albums. But as Christmas bleakly approached, Seeger faced an uncertain future. In August he faced a hostile panel from the House Committee on Un-American Activities. Unlike other "unfriendly" witnesses who testified before HUAC, Seeger refused to invoke the Fifth Amendment when the committee prodded him about his political philosophies and connections to the American Communist Party. When he refused to answer questions that he felt were highly improper, the panel held the 36-year-old musician in contempt. Costly legal challenges and the likelihood of prison loomed ahead. College bookings Seeger counted on were cancelled after the press reported his testimony; the few jobs he was offered barely covered expenses. Nor was Hays faring much better. Looking all of 60 years old but actually only 41, he scraped by as a free-lance writer, penning finely crafted stories for 'Ellery Queen's Mystery Magazine,' pseudonymous pulp for men's magazines and commercial jingles for radio. Like Seeger, Hays also was subpoenaed before that HUAC panel that August. And like Seeger, he was an "unfriendly" witness, but dodged potentially incriminating questions by invoking Fifth Amendment privileges. By comparison, 29-year-old Ronnie Gilbert was doing considerably better than her former partners, but from a continent away. Married to a dentist, she now lived in California, devoting much of her time to raising her young daughter. Still, Gilbert often thought about singing again to appreciative audiences. Harold Leventhal, then serving as Seeger's manager and mentor, felt the time was ripe to get the Weavers together again – if anything, to redirect its members away from the creative lethargy that marked the past three years. He also knew how contentious each of them could be. Making a few calls, he learned Town Hall was unavailable, but Carnegie Hall had Christmas Eve open. Clearly, it was an expensive gamble, but Leventhal secured the space for the evening. Knowing it would be difficult for the Weavers to refuse him, he told each member that the other three agreed to this one-night-only reunion. "Harold didn't know whether anyone would remember the Weavers, or whether anybody would show up," Hellerman told Mary Katherine Aldin in 1993. "But he felt something had to be done." When a small display ad promoting the concert appeared in a New York newspaper, tickets sold out almost immediately and hundreds of others were turned away. Attending the show was an act of defiance against the bigots and rightwing zealots who unrelentingly harassed the group earlier in the decade. 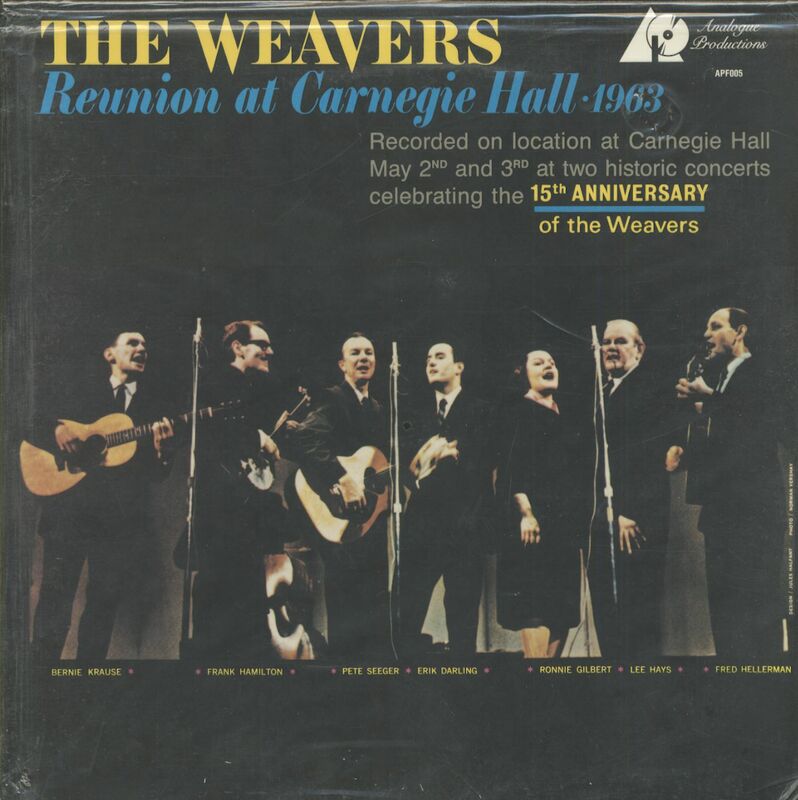 The audience's highly charged, emotional response to the Weavers' first appearance on stage took the group by surprise. After unhappily ending its career playing second-rate clubs like Duffy's Stardust Room on the outskirts of Cleveland, the Weavers triumphantly reemerged in America's leading concert hall. After the holiday, promoters from across the country called Leventhal, inquiring about the group's availability. 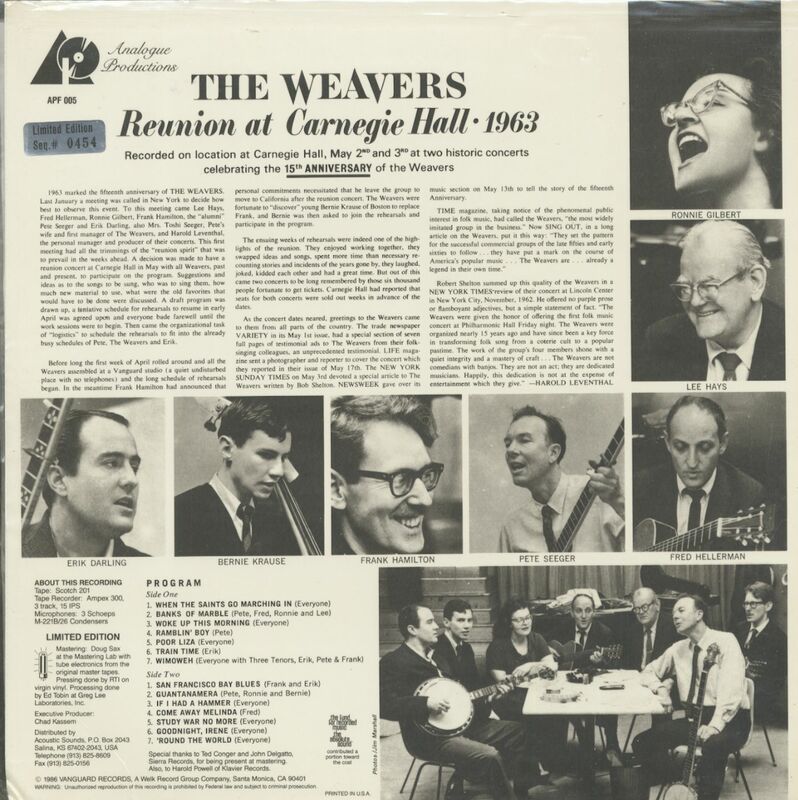 Carnegie Hall concert launched a new, highly rewarding phase of the Weavers' career, augmented by a series of popular albums on Vanguard. From LPs to eight-track cartridges to cassettes to compact discs, these recordings basically remained in print for forty years. However, the earlier Decca singles that made the group's national reputation have only been sporadically available. Kundenbewertungen für "Reunion At Carnegie Hall 1963 (LP, Ltd Edition)"